There aren't many games that provoke an audible response of shock or surprise in a seasoned video-game veteran such as myself. I like to think that I've seen it all. And while this newest game from Epyx does not establish an entirely new theme or signal a radical departure from tradition, it does tread bravely into familiar territory—and takes no prisoners. Basically two complete games in one, Technocop lets you live a high-speed police chase and criminal arrest set in the not-too-distant future. After booting up, the first phase of play has you propelling your VMAX Twin-Turbo Interceptor down a desolate highway, always on the lookout for a felon. 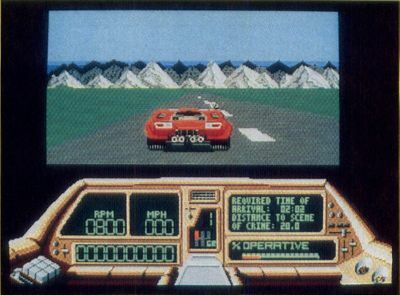 Once alerted via your on-board computer, you race to the scene of the crime, blasting or bumping DOA (Death On Arrival) criminals off the road or breezing by them at more than 200 mph, keeping in mind that within each vehicle are your enemies. If you survive and arrive before the clock runs out, you'll progress to the second stage of play. Exiting your car, you enter the tenement building within which hides the crime kingpin you seek. Hiding out with him is his band of ruthless henchmen, who will stop at nothing to protect their boss. Successfully making it through all the tenements requires reflexes that would turn Dirty Harry green with envy. Every gamer without an ST will turn green when they see these graphics. When you're in your car, the screen display is predictable enough: an instrument console beneath the view from above and behind your car. But the first time you exit the vehicle and enter a crime scene, I personally guarantee that there's no way you'll be ready for what you'll see. The bottom of the display fills with an image of your left arm, upon which is strapped your wrist command console. This futuristic device displays a mug shot of your adversary, along with your orders: whether he is to be brought in dead or alive. The midsection of the console contains radar that shows the location of the lawbreaker, crime clock counting down your time limit, and health and strength indicators. 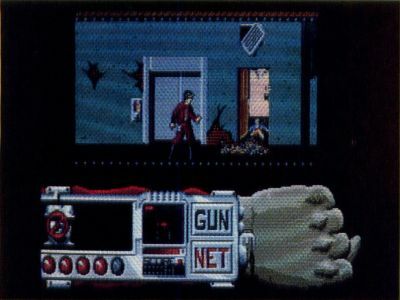 Large flashing buttons indicate whether you have chosen a gun or a net as your weapon. As you walk toward the crime boss, the scenery that scrolls smoothly by is as ugly as the world you have chosen to inhabit. Graffiti adorns the walls of the slum, innocent bystanders wander the halls. Just don't get lulled by the great graphics, for the moment you least expect it, a punk will appear and try to waste you. You're particularly vulnerable as you leave an elevator or walk by a door, which may suddenly open with a realistic creak, revealing a deadly delinquent. Your biggest shock will come when you blow away the first minor hood. 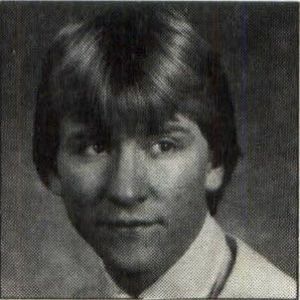 Suffice it to say that there is little left of the punk's twitching body after taking a few slugs from your .88 magnum. While this graphic display might be worthy of an "R" rating in a motion picture, this cartoonish mayhem is just good fun. If you survive his goons, you'll discover that each crime chief has his own modus operandi and must be dealt with in a specific way. In addition, each tenement is a maze that must be mastered before progressing to the next. All these factors make for a game as addictive as any I've seen. The game is not perfect. Close, but not quite. The main problem involves the lengthy disk swaps and loads that accompany the transitions between the two phases of play. Each portion of the game, being a nearly complete game in and of itself, seems to occupy all the ST's memory. To continue nitpicking, I thought the driving portion could have been a little stronger, maybe more like Spyhunter, with a greater variety of weapons and scenery. But despite these misgivings, I can't think of anyone who wouldn't be satisfied with Technocop. It would be a crime to leave it on your dealer's shelf.